The Sixth Annual Lincoln Homecoming will offer a unique twist in 2019—not only will Lincolns of all eras be on display, but all Ford Motor Company-built vehicles are invited to join the festivities, which will be held at the Lincoln Motor Car Heritage Museum in Hickory Corners, Michigan and the host hotel, Four Points Sheraton in Kalamazoo. “We’re calling the 2019 Homecoming ‘See Ford Blue in Kalamazoo,’” said Mike Denney, president of the Road Race Lincoln Register, the Lincoln club hosting the 2019 Homecoming. The RRLR is one of four major Lincoln clubs that comprise the Lincoln Motor Car Foundation. The others are the Lincoln Owners Club, Lincoln-Zephyr Owners Club and the Lincoln and Continental Owners Club. However, all Lincoln owners are invited to register and attend. The 2019 Lincoln Homecoming committee has planned interesting and enjoyable activities that encompass several days. Participants may participate in all or any of the scheduled events. The events scheduled for the week include driving tours to the Gerald Ford Presidential Museum, the W. K. Kellogg Gull Lake mansion, Vicksburg Historical Village and Bell’s Brewery and a VIP reception at the Lincoln Motor Car Heritage Museum for LMCF major donors. After Friday evening’s banquet, Tony Russo will again conduct our live auction, so be ready to bid on any item you need. On Saturday there will be an all-Ford Motor Company-built car show. 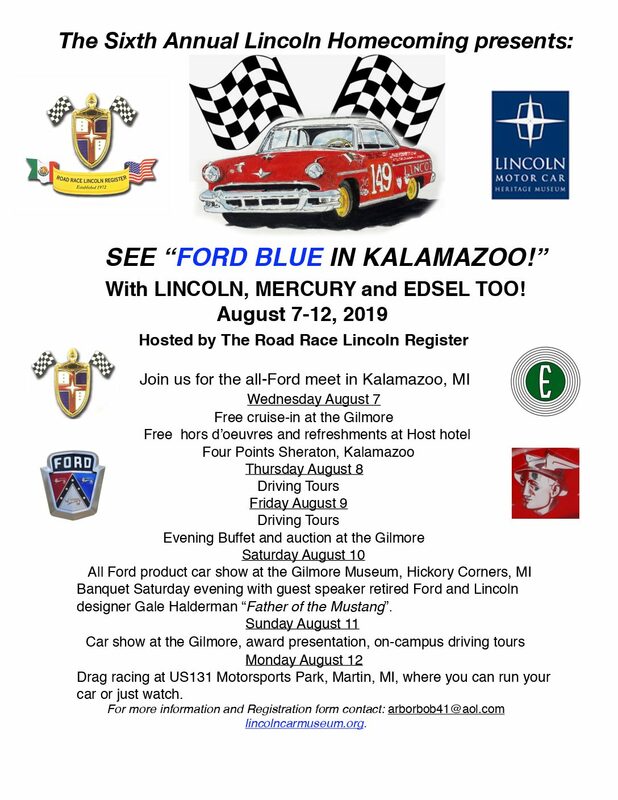 That evening, a banquet will feature guest speaker Gale Haldeman, designer of several Ford and Lincoln vehicles, including the original Mustang. On Sunday, there’ll be a car display and awards presentation. Something new has been added for Monday—an all-day visit to the U.S.131 Motorsports Park in Martin, Michigan, where individuals can run their cars or simply watch. Festivities will begin Wednesday, August 7 and conclude Monday evening, August 12 but, as noted, you may register for all or individual events. This meet will be non-judged for all cars; there will be People’s Choice awards for Best of Show, and Best of each Decade, as voted by participants. There will also be a Ladies’ Choice Best of Show Award. The meet is open to members of all Lincoln clubs as well as non-club Lincoln owners. In addition, owners of any Ford Motor Company-built product are invited to show their vehicle on both Saturday and Sunday—Lincoln, Ford, Edsel, Mercury, hot rod or custom car. The host hotel is the Four Points Kalamazoo by Sheraton, 3600 East Cork Street, Kalamazoo, Michigan 49001. The Four Points offers excellent accommodations, excellent food, and fine amenities. The hotel is just over 15 miles from Hickory Corners. A complimentary hot breakfast for two is included in the room rate of $117 plus tax. A limited number of rooms are available at this rate; please register early. To make room reservations, call 269-385-3922 and use the code “Lincoln Club” to obtain this special room rate (which is good for three days before and after the meet). Room reservation cutoff is July 21, 2019. On Saturday and Sunday, there will be a Lincoln and Ford products swap meet and car corral area on the Gilmore Car Museum grounds with major vendors in attendance. More information will be included in registration packets. Wednesday evening, attendees may drive to the Gilmore Car Museum to enjoy their free weekly cruise-in night. A second choice is free hors d’oeuvres and refreshments at Four Points Sheraton Hotel (for hotel guests only). Attendees will be able to relax and have the opportunity to visit with some of your longtime friends and meet new enthusiasts. Thursday will have a choice of a full day of activities with two driving tours from which to choose. One will be a tour to Vicksburg Historical village. The other will be to the Kellogg Bird Sanctuary and Kellogg Manor House (which includes a plated lunch) and the Bell’s Brewery in nearby Galesburg. Thursday evening will feature a special welcome buffet at the hotel. Friday will also offer a choice of two different driving tours. First, is a driving tour to the Gerald Ford Presidential Museum in Grand Rapids (including lunch). The second driving tour will be to the Kellogg Bird Sanctuary, Kellogg Manor House (which includes a plated lunch) and the Bell’s Brewery. At 5 p. m. a LMCF Donor Reception will be held at the Lincoln museum for all LMCF Lifetime members. Friday evening will begin with a Happy Hour at the Gilmore Car Museum Conference Center, with a Texas-style barbecue to be followed by a lively Lincoln and Ford parts and memorabilia auction. Tony Russo will again conduct our live auction. “We need merchandise for the auction; please check your garage for unused parts and literature that fellow enthusiasts will be interested in bidding on. Please bring plenty of cash or your checkbook and take home some great items for your Ford product. This auction helps maintain and support our beautiful Lincoln museum,” said Mike Denney. On Saturday morning, we will drive to Hickory Corners for the car show, with Road Race Lincoln era cars front and center. All cars must be on the show field by 10 a.m. and remain until 3 p.m. At 3 p.m. there will be a car parade around the Gilmore grounds featuring all Ford Motor Company-built automobiles. Saturday night will begin with a happy hour and banquet at the Gilmore Car Museum Conference Center, where attendees will enjoy the company of fellow vintage car enthusiasts. On Sunday morning we will again drive to Hickory Corners to begin our Ford Motor Company Products Car Show from 10 a.m. to 1 p.m. All vehicles must be on the show field by 10 a.m. All People’s Choice Awards will be handed out at noon. At 1 p.m. we will have a car parade around the Gilmore grounds featuring all Ford products. Pictures will be taken after completing presentation of awards. Sunday evening will feature a Mexican buffet at the Four Points hotel. On Tuesday we bid farewell to our old, and new found friends and have a safe trip home. If you’re considering attending the Homecoming contact Bob Johnson, 651-257-1715; email arborbob41@aol.com or Mike Denney at 918-366-2034; email cosmo1946@hotmail.com. By doing so, you’ll be placed on our list to contact you via email or USPS mail with your meet packet as soon as it becomes available. You may download PDF forms at www.LincolnCarMuseum.org.